Stumbled on this one today, which could be useful to friends and family, the NYC Transit Map. This unassuming programmer Greg Brail has a day job and doesn’t seem to want to be bought by Google or anyone else. The applet has been on the Internet since 1996. About 1000 people use this per day, but this tripled on Sept 11, 2001. 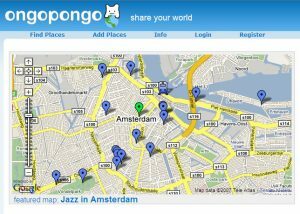 See the blog for developments in the Google Maps Platform since 2008. 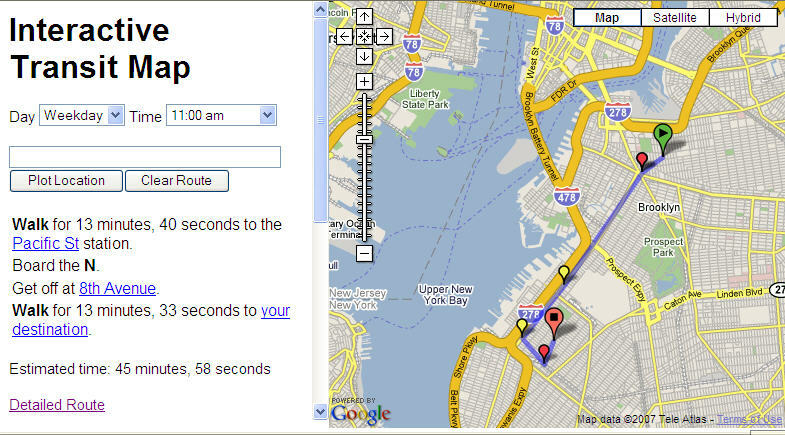 Discovered two resources which will help a lot: 1) Mapki – A wiki (knowledge base) on Google maps API, and 2) Google Maps Tutorial by Mike Williams. Gonna read that one cover-to-cover. Best I’ve seen so far. Yesterday they launched “Sky in Google Earth“. 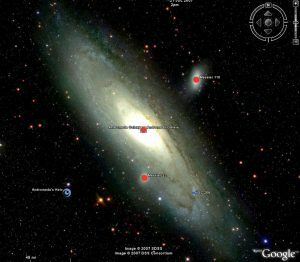 (Why not Google Sky? Probably someone snapped up the domain name and wants to get rich. Or could it be a certain embarrassed restraint: ”We’ve claimed the Earth, but can we really claim the Sky?”) Its all over the blogs, and now all over the big news channels too, probably the most significant news since Earth itself… also significant because of the additional attention it will give to Google Earth and Maps. Just took a peak and it is truly amazing. What do I know about the heavens. I did a search on “Andromeda” (the movie? ), and the answer, “Do you mean the Andromeda Galaxy?” Of course! So here’s a picture. Staring hard at the screen I thought there were millions of stars indeed out there. Then realized there was also a lot of dust on my screen. Update May 31, 2018 – Just downloaded current desktop version of Google Earth. In the top bar there is a “planet” button, and there’s where you find Google Sky, along with Mars and the Moon. Ten years further, there is no doubt masses of new information, about the celestial masses. 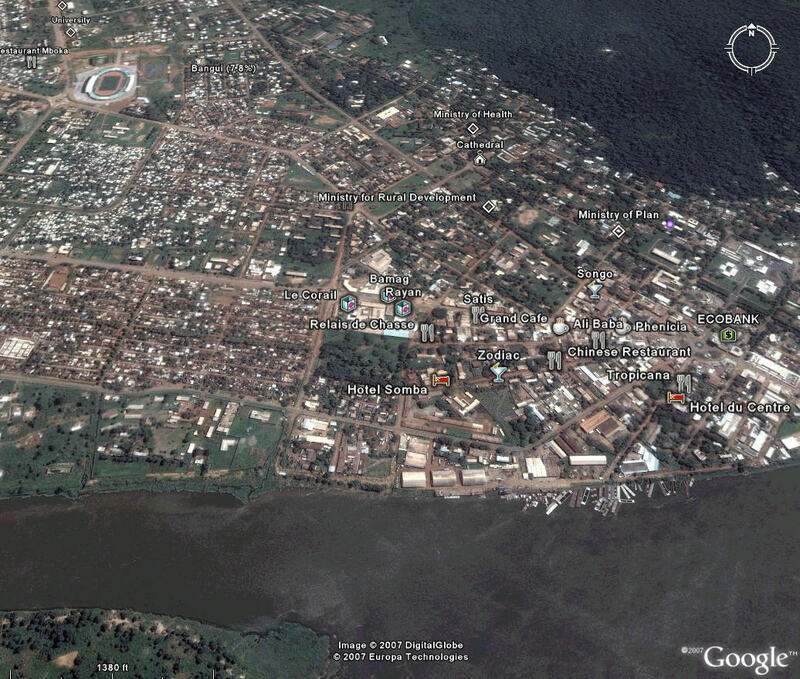 The online version (chrome) of Google Earth does not currently support the “planet” views. 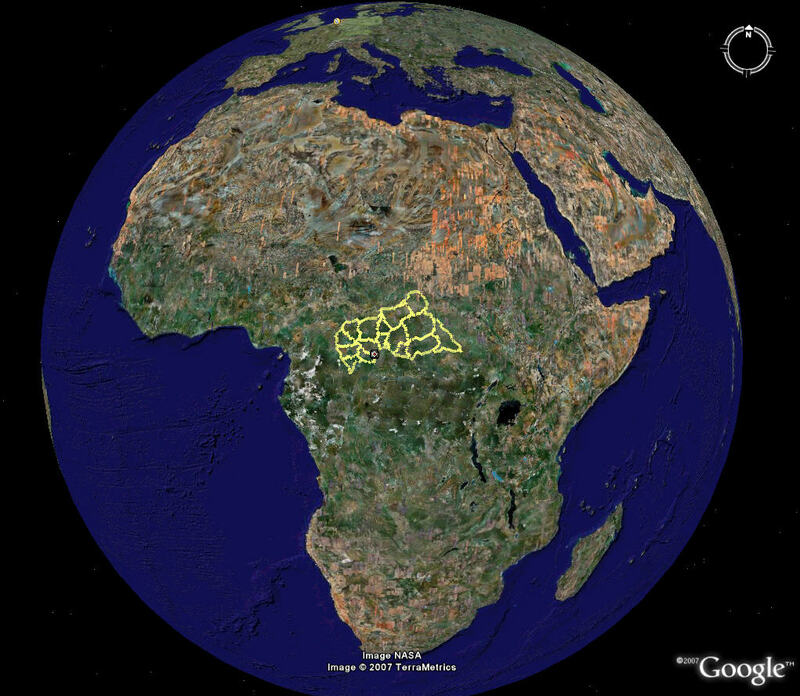 Central African Republic in Google EarthWhile we are on earth, there are things we should not forget about. (Before we soar into space that is.) 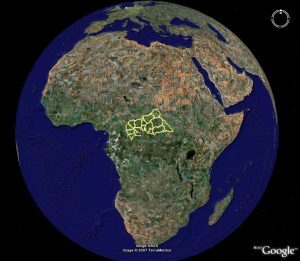 GEB (Google Earth Blog), pointed out this Central African Republic KMZ, created by Humanitarian and Development Partners in CAR. 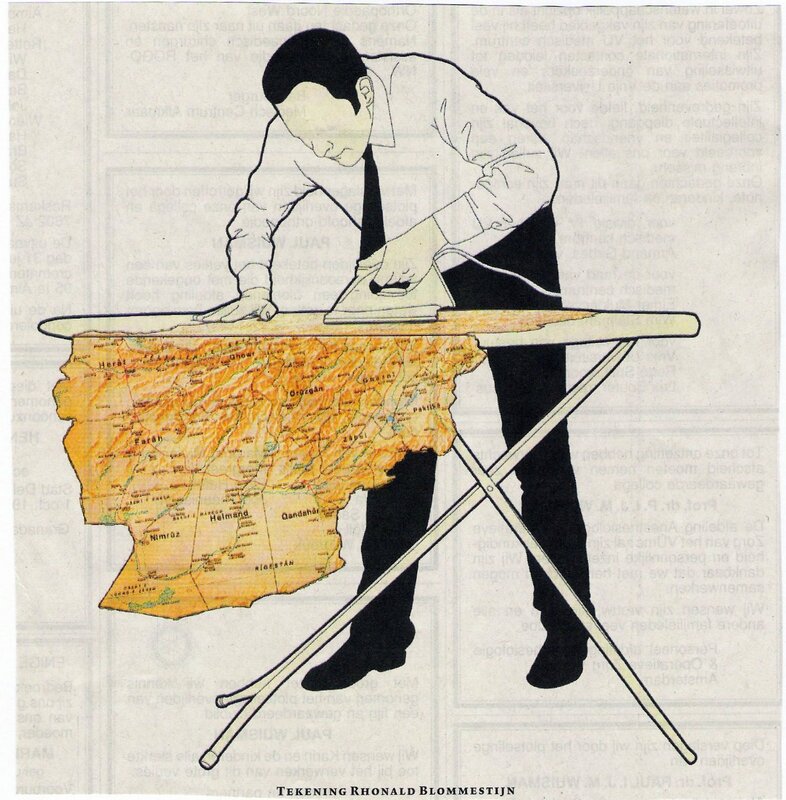 Dozens of layers provide information about this country, not far from Darfur. This is related to the Google Earth Outreach program announced in June. These two images give an idea of the visual impact. 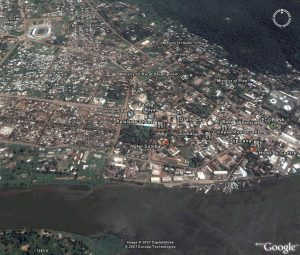 1) Africa is enormous, looks like half the earth here, with CAR outlined like a heart in its center, and 2) zoom in to the town of Bangui and it is just a village, with coffee shops, a Chinese restaurant, a football stadium, university, and government buildings, along a great winding river. So much to be learned here! Storm Tracking Google Earth Blog has posted an amazing collection (a “network link”) of weather tools from a variety of sources. This is a wonderful assembly by various authors, including live weather images, and animated projections of hurricanes. GEB has organized them in a way which is very easy to use, and the layers only turn on when you select them (unlike may other kmz files which load automatically), so it does not surprise you by taking a lot of time or computer memory. 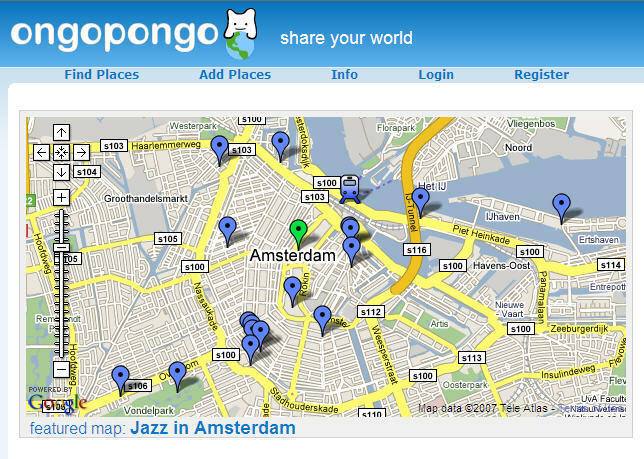 Drag and drop from their site did not work for me, but the KMZ file can be downloaded or opened from here. The blog article also explains the value of “network links” in Google Earth. Update 31-5-2018: Many of the links here seem no longer useful. 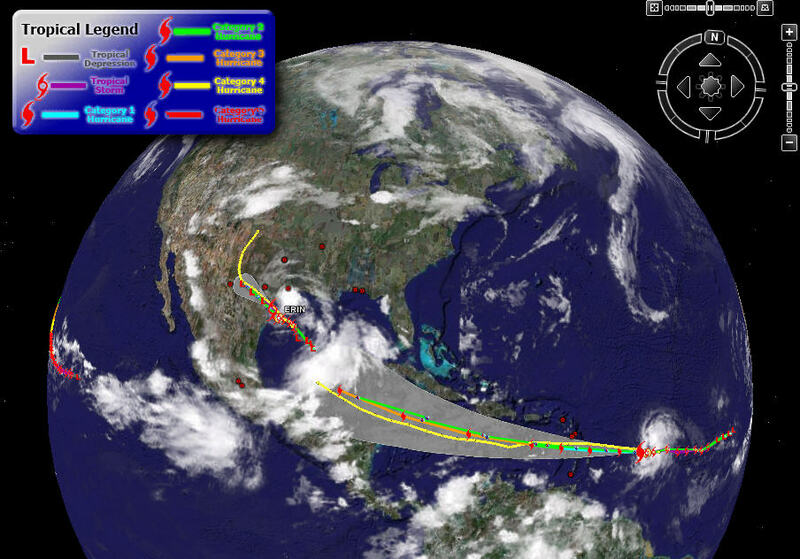 No doubt there are many new sites and apps for hurricane tracking. Google has their own highly-rated Android app, Seastorm. 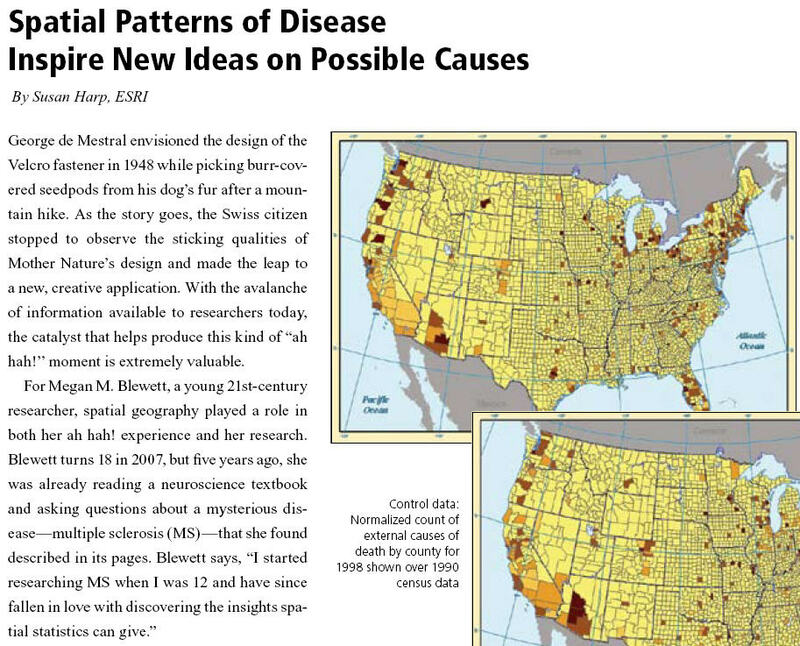 The spring edition of “Healthy GIS“, ESRI’s newsletter for GIS users in healthcare fields, features a fascinating article about a young (18 years old) researcher who is investigating the causes of MS, using GIS software. 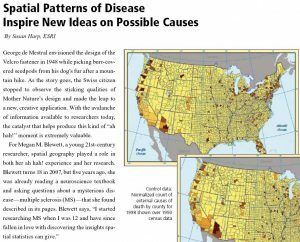 Correlating data on the incidence of Multiple Sclerosis by US county with the incidence of Lyme disease, Megen Blewett, has developed a hypothesis about a possible cause for MS: secondary tick bites. Whether or not this hypothesis is scientifically and bio-medically validated (apparently scientists are now looking into this), the article illustrates a fascinating approach to medical research which is probably greatly underutilized. As young Megan herself explained, the greatest difficulty was finding the data. She claims to now have (to her knowledge) ”the largest standardized data set of Lyme information.” She wants to expand her research globally. Her website is: www.msgeographics.com (no longer exists). Note, this is a case where GIS software (such is ESRI ArcGIS) must be used for spatial statistics, but it is fantastic to think about Google Maps / Earth becoming tools for sharing the results. Update 31/5/2018: Where is she now? Starting a promising career it seems. Megan Blewett. 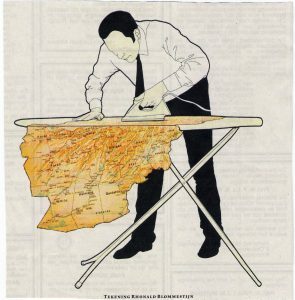 A New York Times article by Barbara Whitaker today highlights the growth of private sector GIS (geographic information systems) jobs.